To view 9 more pictures, interactive maps and the full, detailed description of the Highland Parish community, please Login. 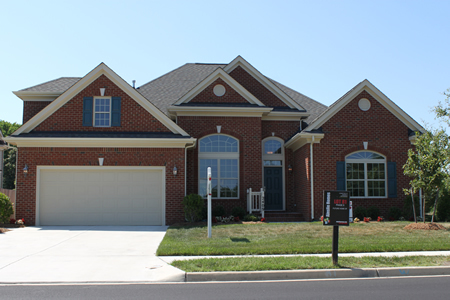 Discover new construction with builder upgrades in Highland Parish. These elegant houses for sale comprise a small community in central Virginia Beach, VA, near some of the area’s best private schools. This development is the perfect place for growing families. Service members will find painless commutes to military bases like NAS Oceana, the Coast Guard Finance Center and Dam Neck. Those who work in law and medicine can make their way easily to Princess Anne Sentara Hospital and the Virginia Beach Municipal Center. The houses for sale here are true showplaces. The builders have tended to all the minute details ensuring a final product of long-lasting splendor. Every new construction home in Highland Parish may feature a sunroom, pass-through fireplace, hardwood flooring, natural gas heating, first floor master suite, finished room over garage, granite kitchen countertops, fenced backyard, stainless steel appliances, kitchen pantry, porch, in-law suite, intercom, security system, ceiling fans and so much more. Virginia is home to some of the best cities in the country, but none offer the diversity of Virginia Beach. From these houses for sale, residents can get just about anywhere in Hampton Roads in a matter of minutes. The builder must have known how important it is to be close to city amenities because this new construction development is right in the thick of things. Golfers can play on courses at the Virginia Beach National Golf Club and the Honey Bee Golf Club. Rock out to concerts at the Verizon Wireless Virginia Beach Amphitheater. Highland Parish is also close to shops, churches, restaurants and banks. Today’s homebuyer can be pleasantly surprised when he finds what the builder has created inside this elite community. New construction homes have traditional architectural elements but still look up-to-date in every way. Real estate in Highland Parish offers residents value, class and charm. Send me more information about the Highland Parish new home community. Our agents gladly offer FREE property tours of Highland Parish, Virginia Beach and homebuyer consultations to all serious buyers.